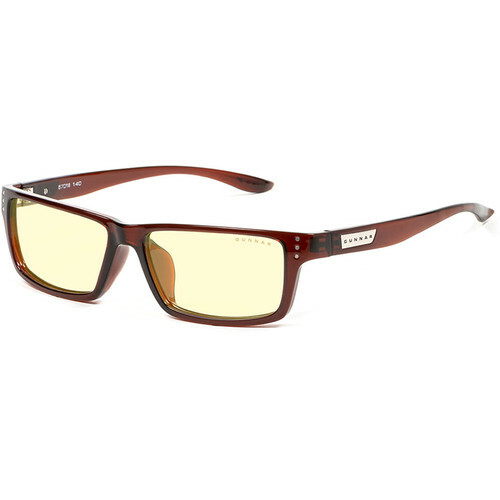 Help reduce the strain on your eyes caused by hours in front of the computer or TV with the espresso with amber lenses GUNNAR Riot Computer Glasses. They are designed to block up to 65% of harmful blue light and up to 100% of UV light, which may reduce the risk of vision problems. With curved nose rests, these glasses are designed to provide even weight distribution and comfort. Additionally, they have a lightweight design at just 0.9 oz, making them well suited for long-term use. The amber lens tint is engineered to provide enhanced contrast and visual performance while minimizing screen glare and diminishing the harshest parts of the color spectrum by filtering out up to 65% of harmful, high-intensity blue light.